As much as the impact of Brexit on growth is the focus of debate at the moment, the UK’s disastrous productivity growth and persistently low levels of investment pose a much bigger on-going threat to our economy. Indeed, the IMF notes this week that ‘over the medium term, growth prospects [in the UK] will depend on the extent of recovery of labor productivity, which has been very low since the financial crisis’. A significant proportion of economic growth since the 2008 crisis has been driven by a larger workforce and greater consumer spending (most notably credit card debt). But what the UK really needs to prosper is productivity-induced growth driven by innovation and the adoption of new, more efficient technologies. This allows each worker to produce and earn more, boosting our wealth. This requires investment. Not just investment in new machinery and new infrastructure, but also in new technology, new skills and new business practices. The problem is that currently the UK is failing to invest. The volume of investment in the UK has fallen from the equivalent of a quarter of GDP in 1990, when it was broadly in line with that of other developed economies, to just over 16 per cent – well below that of most advanced economies. Businesses, the drivers of innovation, are the most in need of investment. 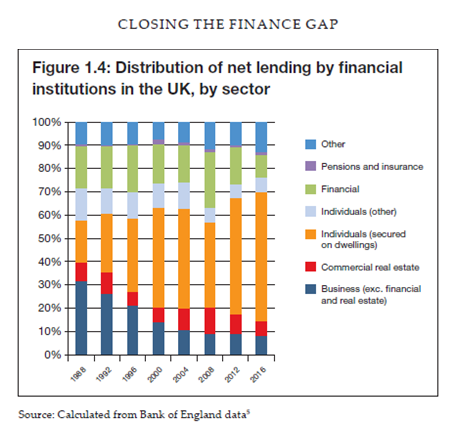 Yet lending to business by banks as a proportion of their domestic lending has declined from 31 per cent in 1988 to eight per cent in 2016. In fact, business lending accounts for just five per cent of UK bank assets, in comparison with the Euro area where business lending accounts for 14 per cent of bank assets. This is in part because banks prefer to maximise their profits via less risky mortgage lending (see table). SMEs have suffered particularly badly, with net lending to small businesses declining year-on-year since the financial crisis and net lending to medium-sized businesses only starting to pick up again in 2014. In 2016/17, one fifth of SMEs were still unable to access suitable finance. There is no doubt that low investment, particularly in enterprise, is a cause of the UK’s current economic woes and a significant part of that problem is a failure of the banks to lend to SMEs, which make up 99 per cent of businesses in the UK. Various countries, including the UK, have or have had national development and investment banks and agencies which have been set up to address specifically these issues. In Closing the Finance Gap, a new Civitas report, we highlight some examples. Germany’s KfW for instance, had in 2016 a financing volume of €81 billion, of which €21.4 billion was for the promotion of SMEs. The US Small Business Administration, in another example, approved lending to small businesses of almost $29 billion of lending in 2016. It is not just Germany and the US. National investment and development banks are incredibly common. France has the Banque Publique d’investissement (BPI) which injected €24 billion into its economy in 2016. Spain has the Instituto de Credito Oficial (ICO) which provided €5.4 billion of investment in 2016, having provided €61.5 billion to the Spanish economy between 2012 and 2016. Italy has Cassa depositi e prestiti (CdP) which lent €30 billion in 2016. In comparison the UK government currently supports SMEs though the British Business Bank, which provided only £0.7 billion in new commitments in 2016/17. This is a tiny amount which fails overcome the significant disadvantage UK SMEs face, especially as much of it was invested through venture capital funds, who are often looking for the company to be sold off at a profit within years and therefore do not looking for long-term development. A new national investment bank, governed by a mandate to support SMEs, operating fully independently of government and able to raise its own funds through the issuing of bonds, could provide a sustainable source of suitable long-term investment for UK business. In doing so it would help tackle the UK’s underlying productivity problem and at no on-going cost for the taxpayer. Closing the Finance Gap: How a national investment bank could support enterprise and raise productivity is published by Civitas today and can be read in full here.